Guess Where I'll Be Tomorrow? I am so so excited to finally announce that starting tomorrow, I'm "hosting" the Valentine's Countdown on Nickelodeon's Parent's Connect! For ten days, I'll be sharing super sweet ideas you can use to celebrate Cupid. From treats like cookies and cupcakes to photo op and party inspiration, you're sure to find something fabulous for February 14th. And that's not all - Parents Connect will also be giving away prizes every.single.day! How cool is that? So if you're not already registered at Parents Connect, head on over and create a profile now so you can get in on all of the action tomorrow morning when I'll be showing off eight great ways you can throw Valentine's Day bash. Trust me, you won't want to miss it! See you there. For day 13 of the VALENTINE FREEBIE FESTIVAL, I've got a great alternative to handing out candy - and the fabulous printable to go along with it! I've been trying to come up with something cute that Gabrielle and Alaina could "hand out" to their fellow toddler pals on Valentine's Day besides plain old cards. But we did crayons last year and candy isn't really an option for two year olds, so I was at a loss. And then I saw this fabulous idea on Twig & Thistle! Who says your Valentine's Day treat can't be naturally sweet? Giving fruit may seem silly but not when they're adorned with adorable free printable stickers like these! There's "Orange you glad you're my Valentine?" "We make the perfect pear!" "I'm going bananas over you!" And my personal favorite "You're the apple of my eye!" Whether your kids hand them out to friends or find one from you when they open their lunch box, these fun messages are sure to be a hit! You can download the free printable banners here at Twig & Thistle, and if you have a free Valentine's printable you'd like to share, enter it into the link up below! *If you are reading this in via our e-mail newsletter or RSS feed, the link up won't show up. You have to visit the post on our website to view it. 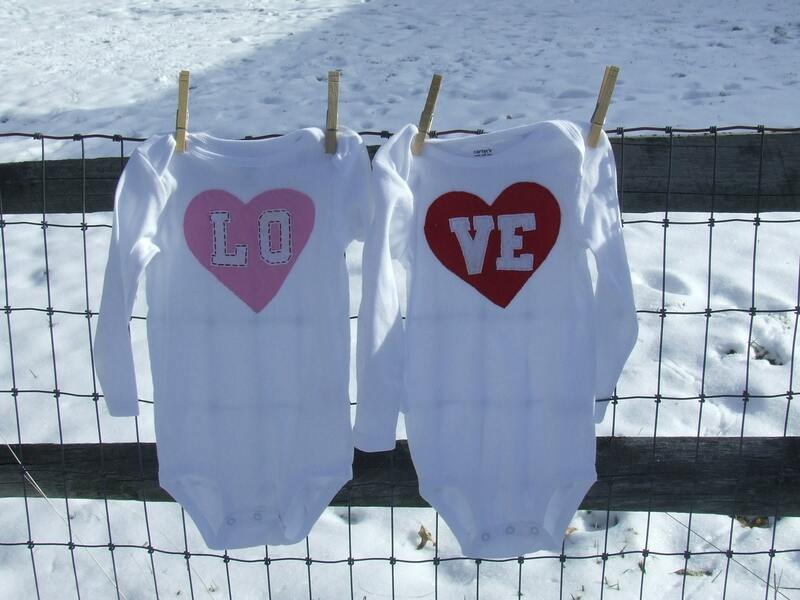 I'm all about dressing Gabrielle and Alaina up for Valentine's Day. Two years ago, they were just a few months old so their get ups consisted of onesies and leggings. Last year, I went with tutus and initial tees. So you can probably guess what I'm on the hunt for now, right? Luckily for me, klzart, one of my favorite Etsy sellers, just added has a whole bunch of Valentine's designs to her shop. So what do you think? Should I go with the LO-VE appliqued tops? 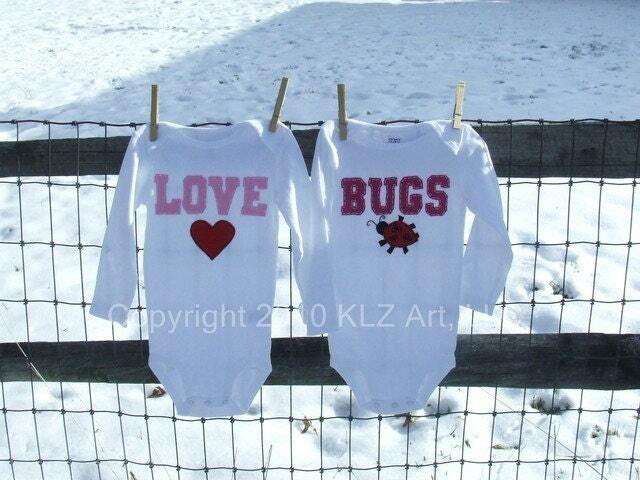 The super cute love bugs? Or two of the Conversation Heart tees? But getting the girls to sit together is a challenge enough these days, let alone sit in "order." VE-LO may not translate! So maybe I'll get the conversation hearts with their names in them instead. All of the klzart tees feature hand sewn appliques, and while the listings state that they're for Twin-zies or Trip-zies, Kelly can customize them for siblings or friends, too, so if you need one onesie and one larger tee or just three different sizes, it's no problem. I've posted before about how great the quality of her work is so if you're looking for the perfect Valentine's Day number for your kiddo, look no further! Visit klzart on Etsy and add the store to your favorites. "Like" klzart on Facebook and leave a comment that A Few of My Favorite Things sent you. Click here - - to vote for AFOMFT on Top Baby Blogs and post a comment here that you did. You can vote once per day per computer so if you vote every day or on different computers, be sure to post one comment for each one. Please leave a separate comment for each entry (two if you've blogged about the giveaway) and make sure to include a link to your tweet, blog post, etc. All entries must be posted on AFOMFT as a direct comment to this post. Comments on Facebook will not count as entries. This giveaway is open to residents of the U.S. and Canada and ends February 1st at 11:59 pm EST. The winner will be selected by random.org and announced on AFOMFT on February 2nd. If the winner does not contact AFOMFT within 48 hours, a new drawing will be held so be sure to check back to see if you've won! And that's not all! AFOMFT readers will get a 10% discount on all orders from klzart by using code AFOMFT at checkout! This discount does not apply to shipping costs and expires on 2/15/11. Happy shopping! It's day 12 of the VALENTINE FREEBIE FESTIVAL and today's pick is a simple tag from Giver's Log that you can attach to any treat you're handing out. But the perfect way to use them? Tied to the back of fun candy airplanes like these! You can download the free printable banners here at Giver's Log, and if you have a free Valentine's printable you'd like to share, enter it into the link up below! Are you on the hunt for unique and fun Valentines? Look no further than Pear Tree Greetings! They sent me a package of samples of their Kids Valentine's Day Cards to review and let me tell you - the quality is fabulous. The paper is nice and thick and the colors are vibrant. And there's a design for everyone. Personally, I always like photo cards and for girls, I love the Queen of Hearts. And this flower is super sweet. The Robot card is perfect for your little love machine. And the spaceship is out of this world! And sassier versions that are great for older kids. And Sticker Sets, which are great for crafts or making DIY cards. I think my favorite of all of the Valentine's offerings is this photo card - it also has a magnetic back so your friends and family can hang on to it long after February 14th has passed! Did you spot a card you just have to have? Well, you're in luck because we've got a giveaway and a discount for you! Visit Pear Tree Greetings and post a comment telling me which Kids Valentines Card style you'll choose if you win. Please leave a separate comment for each entry (two if you've blogged about the giveaway) and make sure to include a link to your tweet, blog post, etc. All entries must be posted on AFOMFT as a direct comment to this post. Comments on Facebook will not count as entries. This giveaway is open to residents of the U.S. and Canada and ends January 31st at 11:59 pm EST. The winner will be selected by random.org and announced on AFOMFT on February 1st. If the winner does not contact AFOMFT within 48 hours, a new drawing will be held so be sure to check back to see if you've won! If you can't wait to order your Valentine's Day cards from Pear Tree Greetings, use code HEART10 to get 10% off! This discount cannot be combined with other offers and expires on 2/28/11. Happy shopping! Please note that I am now a Pearista, which means I have partnered with Pear Tree Greetings to offer great giveaways and discounts to my readers. I do not receive any monetary compensation from them but they will occasionally send me free product to try out. Whether I choose to post about their company or not is totally up to me and my opinion of their products is solely based on my experience using them. 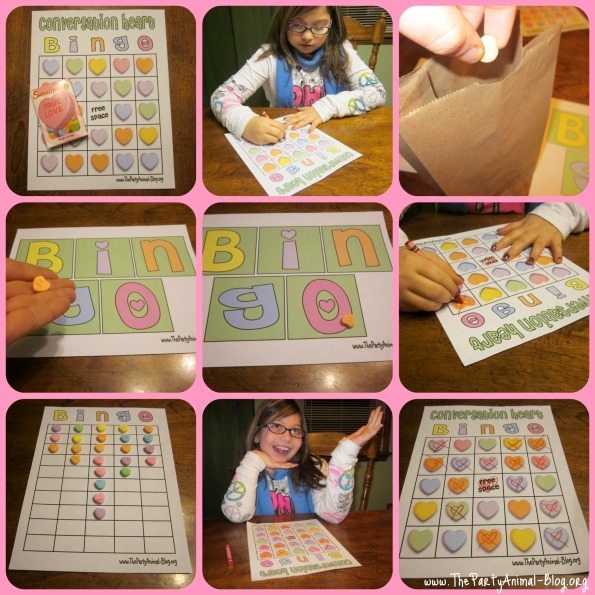 Today's pick from our VALENTINE FREEBIE FESTIVAL a super fun activity older kids will love - Conversation Heart Bingo! Nicole, aka The Party Animal, created this game and it's so easy to play. Just put a bunch of conversation hearts in a bag and have the "caller" draw them one at a time. Roll each one onto the calling card and then have the players mark off the result - the color of the heart plus the letter from the card. And the best part of this game is that everybody wins because there are lots of tasty candies to eat when it's over! 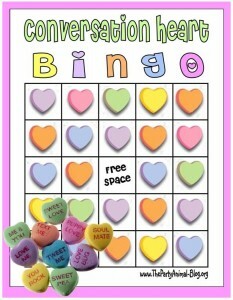 You can download the free printable conversation heart Bingo game here at The Party Animal, and if you have a free Valentine's printable you'd like to share, enter it into the link up below! 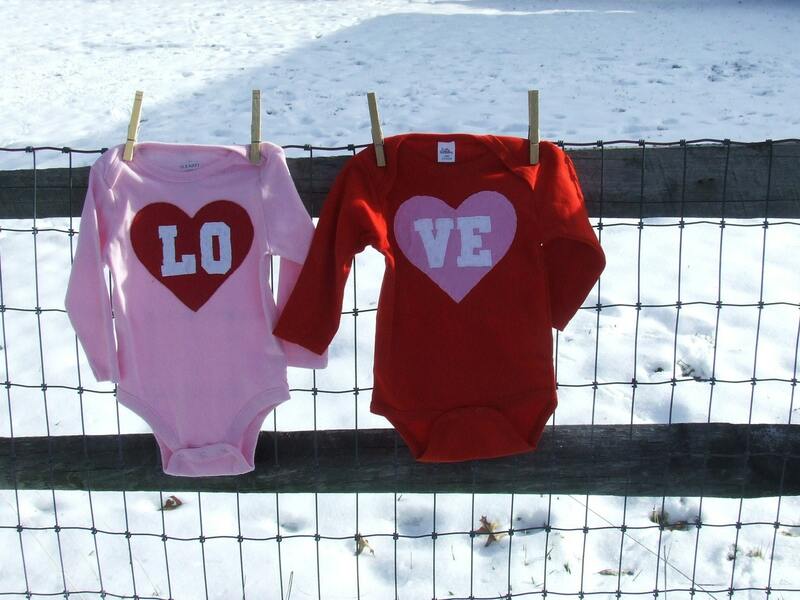 For day 10 of our VALENTINE FREEBIE FESTIVAL, I'm sharing two fab freebies from a site I love called Supermom Moments. 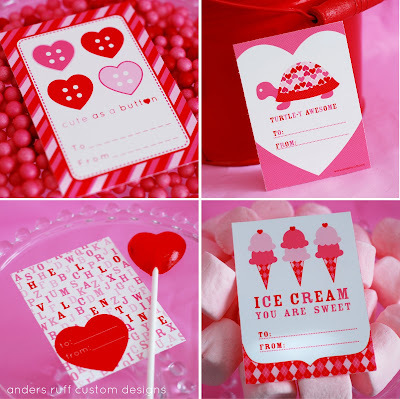 Both of these ideas are simple but fun ways to add some flair to the cards your kids give out on February 14th. And have your little one sign the back. Option number two is the Sip-a-dee-do-dah Valentine - simply glue a message to a silly straw. Now really, does it get any easier than that? I love these ideas because they're unique and cost a few cents each. They'd make great party favors too. I'm just sayin'! You can download these free printable valentine messages for the bouncy balls and straws via the links above, and if you have a free Valentine's printable you'd like to share, enter it into the link up below! It's day 9 of our VALENTINE FREEBIE FESTIVAL and holy guacamole - there are more than 100 amazing printables linked up already! You can plan a cupid-themed party, make some great games for your kiddos and print out enough valentines to send out to everyone you know and then some. And all for FREE! 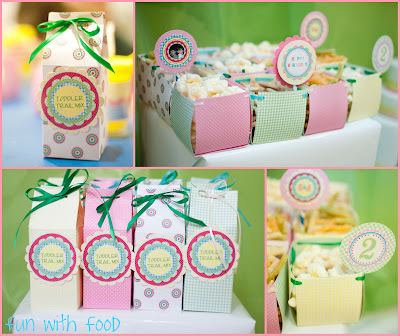 Today's featured freebie comes from my good friends Maureen and Adria of Anders Ruff. I've had the pleasure of working with and spending time with these lovely ladies and they are truly two of the most warm and genuine people ever. I just adore them! And they are so so good at what they do. You may remember they designed the fabulous printables for Gabrielle and Alaina's birthday party. 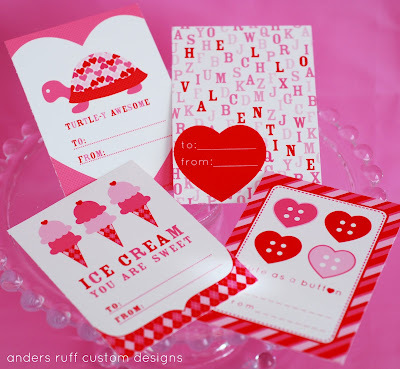 It's been almost one year since Maureen and Adria launched Anders Ruff, and to celebrate, they created four free printable valentines. That's right - to celebrate their anniversary, they're giving us a gift! How fab is that? I love the funky patterns and adorable sayings. One of these will be perfect for everyone on your list! You can download these free printable valentine cards here, and happy birthday/anniversary (what the heck should I call it, anyway?) to Anders Ruff! Can't wait to see what the two of you come up with this year. If you have a free Valentine's printable you'd like to share, enter it into the link up below! It's been exactly a week since Martha Stewart's Dreamers Into Doers conference ended and I'm still thinking about it - the things I learned, the people I met and how much I'm looking forward to the next one! So what was the event and how did I get there? Let's start at the very beginning. Dreamers Into Doers is an online community on Martha Stewart's website that celebrates women who are trying to turn their dreams into careers, and connects them so they can network with and motivate each other. Last fall, they announced a two-day conference that would be held at the Martha Stewart Living Omnimedia Headquarters here in New York City. I registered, along with hundreds of others, but with only 80 available spots, I ended up on the wait list. Months passed and I still didn't hear anything so I figured it wouldn't work out. But as the date approached, I started seeing more of my "blog buddies" Tweeting and posting about their plans and I e-mailed Caitlin, who coordinated the event, to let her know if any spots opened up that I was still interested and sure enough, less than 12 hours before I had to be there, I got an e-mail with an itinerary. See - persistence does pay off! I showed up bright and early Tuesday morning to The Martha Stewart show studio to attend a taping of her show, which was a blast. Then we were off to MLSO! I was so excited to finally connect with Maureen and Adria from Anders Ruff, who you may remember designed the amazing printables for Gabrielle and Alaina's birthday party. I talk to these lovely ladies all the time so it felt like I already knew them, but actually meeting was wonderful! And here we are with Lindi, from Love the Day, who I immediately clicked with. She's so talented and sweet! There were so many other fantastic ladies I connected with during the conference - some that I've met before and others that I just "knew" from online. It was so great to see Stacy from Scrumptious Swirls and Tanya from Save the Date for Cupcakes again - we all met at Martha's Bloggers Night Out last summer - and I loved getting to know so many of the "party girls" I follow online - Courtney from Pizzazzerie, Charynn from Two Sugar Babies, Andrea from Dolce Drive, Nancy from AtoZebra Celebrations, Kelly from The Party Dress and Team TomKat Studio - as well as the uber-talented Vana from Le Papier Studio. In my excitement about actually attending the conference, I totally forgot my camera so I didn't get photos with everyone but here I am with two more fabulous new friends, Rebeca from Fresh Chick Design Studio and Kim from The Celebration Shoppe. Aren't they adorable? It probably looks like all we did was meet and greet but there were plenty of presentations and discussions too. We covered topics ranging from marketing and PR to using social media, and Martha herself moderated a panel on starting a charitable foundation with Susan L. Solomon, the co-founder of The New York Stem Cell Foundation. One of the most interesting aspects of the event for me was meeting members Martha Stewart Living team and getting to hear more about what they do. 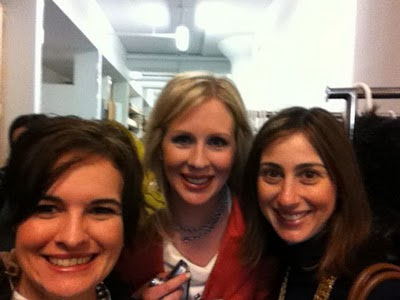 Hannah Milman, the senior vice president and executive editorial director of Martha Stewart Holiday and Crafts - a.k.a. crafter extraordinaire - and one of the most genuinely sweet women I've ever met, mingled with us at lunch and showed off some of her crafting techniques. Sara Carey, one of Martha's senior food editors, demonstrated how to make crepes and spoke about what goes into creating and shooting recipes for the magazines. And at my favorite presentation, Terri Trespicio, senior features editor at Whole Living, talked to us about life balance (here we are afterward). I'm not a new age-y kind of girl by any means, but she totally got me thinking about ways to re-energize and prioritize. If you ever have a chance to see her speak, make sure you're there! 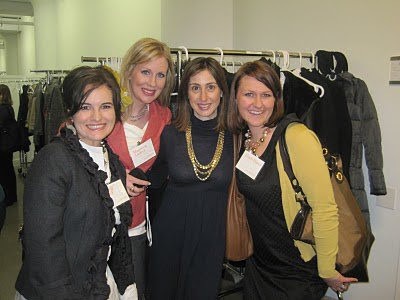 In the meantime, you can check out some of Terri's blog posts here at WholeLiving.com. There were lots of other great women I got to meet over the two days and while I can't list them all here, I'll be posting about them on Facebook, Twitter and hopefully working with a lot of them in the future. A huge thank you to everyone at MSLO who made this event possible, and especially to Caitlin for getting me in at the very last minute. The Dreams Into Doers conference was an amazing experience and I'm so grateful I got to be a part of it! This Week I'm Dreaming Into Doing! Valentine's Freebie Festival Kick Off! DEAL ALERT: 11 x 14 Glass Photos for just $12!